Serendipity is defined by wikipedia as "the effect by which one accidentally discovers something fortunate, especially while looking for something entirely unrelated." I was looking to finish a job and we ended up doing something else. Today was the last day on our job at Double Bayou. Last week we discovered 4 abandoned cats, three young black cats and a little gray kitty. When we got back Monday we found that the gray kitty had died over the weekend. I wished I had taken him to the vet when we first found him and the others. So, I decided not to wait. Today I went out with a cat carrier I bought at Petco and some cat food, not knowing if I would find the surviving small cats alive. Of the three surviving cats, one was missing on Monday. When I pulled up today to the remote Double Bayou building, I saw nothing but my crew working. Then two hungry cats came up and they went for the food I put in the cage. Then my crew said that there was a third black cat, the missing one. I looked and around the corner he came. I wondered if he'd run off. But he let me pick him up and I put him in the carrier with a can of fish, to go with the can of chicken the other two had shared. I expected to bring them to Houston for adoption, and that it would take a lot to find a good home for the. But we stopped for lunch at "Panther Tracks" in Anahuac, and told them about the cats. The waitress said "Don't tell the cook, she loves animals." Well, long story short, the cook needed cats to catch the mice eating the grain in her barn, so she took them. That was a good day. So if you get to Anahuac, I recommend you stop at "Panther Tracks" (two blocks from city hall and the dock). Yeah, a lot of other good things happened today, but saving those three little black kitties was the best thing that happened to me on this St. Michael's Day. The whirlwind continues. Moved into a new apartment facing Clear Lake that has a set of windows facing South. I got a BTU reading of 219 - heat coming through the window. I will be my first customer for Armor Glass Solar Hurricane film! I have to go to finish a job in Chambers County so remote their is no cell service. We found some abandoned cats and one died over the weekend. I will try to rescue the two little survivors today. Got an appt at 8. 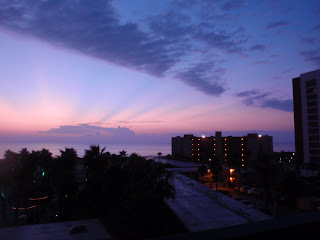 Must go..
It’s called “Island time” here at South Padre Island, the last land before Mexico a couple miles away. At the convention center a sign reads: “No Tie Zone.” Sure enough. I saw no one in a tie, which is easy when its 95 degrees outside. Few know that the last battle civil war was waged nearby, over a month after the Confederate surrender at Appomattox. Port Isabel had a lighthouse which was fought over and the only beacon for ships trying to find this valuable sheltered port. A storm sent several Spanish ships down off these waters with millions in gold and silver, some of it recovered and on display at the tiny but well done Port Isabel Museum. Few know that the Mexico port of Matamoros is only three miles from the historic Port Isabel lighthouse. This area was a crossroads for international trade and territorial disputes since the Spanish first settled it and gave out huge land grants. Yet today, I’m told, much of the land is owned by nationals from other countries, with the Israelis as one of the biggest. They bought a lot of the land in the 80’s and 90’s when it was sand. Now it is high rise condos and hotels. This morning I saw dolphins in the water off the beach. It was an amazing sight. This island paradise on the U.S./Mexico border has some of the most incredible sunrises I have ever seen. There was a regional government group here for an educational retreat/trade show. One of the tasks near the end was for teams to build a sand castle in a competition of teams. The idea of government leaders building sand castles did seem to me to be a bit ironic for awhile, but they were really nice people -- and the castles were pretty clever. I took photos at the link below. Just a year ago we were on the brink of the worst financial disaster since the 1930’s. We were a ship on the rocks, leaking oil badly. Many forget how expensive it is to fix that kind of damage. Now we are rebuilding and the markets are not frozen or in free fall. The problems that got us here still need to be fixed but at least the ship is not going to go under. Yes, the situation has been costly. Wrecks are. And the fixes may not be perfect but we as a nation need to address the big issues like health care and climate change if future generations of Americans are going to have a system that works better than being No. 37 in the world. Ignoring them doesn’t work. Broken systems like broken cars don’t fix themselves. I don’t think our forefathers would sit back and do nothing when 45,000 Americans die each year from lack of health care – more than those who die from illegal drugs. Being out of the daily noise can clear your head. Try it sometime. Our country needs some clear heads to start working on solutions instead of throwing around wild and false allegations. Future generations depend on what we do today to make tomorrow a more secure and healthy America. Today is the last day of a conference/trade show on South Padre Island for government types, so it will be a rush. It's my first time on the island and it's amazing. A skinny island lined with tall buildings, from which you can see water on each side of you. lol. Got to run and will post a photo or two later when I have a chance. It's been clear and HOT, then turned cloudy today. Yesterday, ironically the 8th year I was at the same studio all day as a terrorism analyst, I went to Fox 26 TV and broke a window - not theirs, mine. Eight years ago today I spent the entire day at the Fox 26 studios -- as a terrorism analyst. I had been their Middle East expert during the first Gulf War of 1990-91. The question now is: are we safer than we were before? Or just less naïve? Why was I a “terrorism analyst”? Why could I see things that paid bureaucrats and politicians did not? Because I had been an international attorney with a Fortune 500 company who got laid off and wrote a fiction book on a flash war in the Middle East and an attack on the U.S. - when fiction turned to fact I found myself on TV, trying to analyze what had happened. Others had seen the signs; there was even the August memo to President Bush during his August vacation stating “an attack by Al Qaida is imminent.” Yet we were surprised. Eight years later have we learned anything? Ironically, today I will be back at Fox 26 but not as a terrorism analyst - but as the founder of a company that is providing security technology that protects not just from human explosions, but also from mother nature's explosion of fury in the form of hurricanes and tornadoes. I’m going to break a window on live TV – but our technology will avoid a breach of it. I have to say that it is more rewarding doing something about security than just talking about it. So I have no desire to go back on TV as a terrorism analyst. Now we are faced with either supporting a corrupt leader in Afghanistan stealing an election (just like the conservative regime in Iran removed choice from its people) or leaving Afghanistan so the Taliban can take it back again. Both choices are unsatisfactory. We need to train Afghans to take our place and get out of there. Eight years after 9/11 we are still recovering from the worst financial meltdown since the depression of the 30's - and here in Houston from the destruction of Hurricane IKE, which hit at the same time as the Lehman Brothers bankruptcy that started the meltdown. Religious extremism is still with us and getting worse. BBC TV carried a report last night that the Israeli army, which has always been secular, is now being dominated by rabbi Captains who view war as a religious issue. We could face a time when long bearded rabbis in jets are fighting with long-bearded mullahs in jets. Extremism is even infiltrating the halls of Congress, when for the first time in American history a representative shouts down a President. Civility is on the decline and that is never a good sign. If that trend continues, none of us are safe. We need a return to the center and away from the extremes on both the left and right. Otherwise, we really aren't out of the storm, but may only be in the eye of the hurricane. I figured out how to get peace of mind (aside from being really busy running a green company and not having time for nonsense) - I quit listening to talk radio! A friend of mine called up and said that he was feeling pretty good about his business but every time he listened to a certain national TV channel, he said it made him depressed. I told him the solution was easy: quit tuning it in! Viola! No more stress or depression! lol. I found talk radio to be like an "echo chamber" where people mirror each other’s ideas -- but no one looks beyond the rim for some "outside the box" thinking. Too much of the time it only presents one side - like being in a courtroom where only one side presents testimony then the judge/jury declares it isn't interested in hearing the other side's case and makes a ruling. Somehow that doesn't seem truly balanced and American to me. I think it is time for a return of the "fairness doctrine" so that people get to hear both sides of an issue on these programs instead of only one. For example, I had dinner with some conservative British friends last weekend, who just became American citizens. They would have voted for George Bush if they could have voted, yet they said the British health system "took the stress out" of wondering if you would get health care or not. Maybe we should be listening to people like them instead of shouting at each other --and getting nowhere -- in the echo chamber. We might actually learn something and come up with a better system. So I left talk radio and signed up for satellite radio, which has reduced my blood pressure considerably. Now I listen to CSPAN (for live testimony at hearings) and BBC radio to get a different reality of what is going on. CNN and Fox news are still available if I want it. It's the Peak of Hurricane Season - Erika forming? It's September - the month when most of the big hurricanes have hit the U.S. and Texas. IKE was just a year ago on the 11th, the day I will be on TV demonstrating our technology. More on that later. The window came from Home Depot - a regular window with the same cheap glass everyone has in their homes --not some special thick, tempered glass. So it shows a real test with real windows. Yesterday I got a call from a company in California that had suffered two break-ins in three months. They wanted the film to stop it, which it will. We are so busy that the backlog is now over three weeks. And now we may have a potential "Erika" forming...and Hurricane Jimena in the Pacific is a CAT 5 and about to pound Cabos San Lucas in Mexico, just south of Los Angeles.